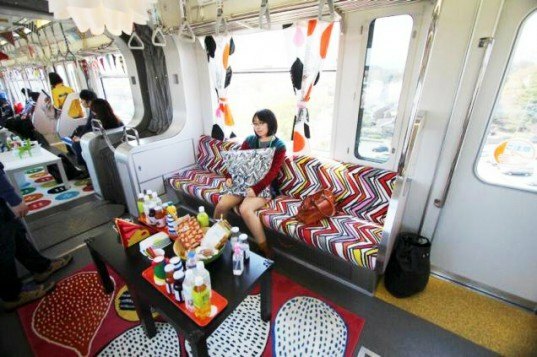 Swedish design wonder IKEA turned an entire monorail into a colorful showroom in Japan. To kick off their latest location in Tokyo near Tachikawa station, the company decorated the train with vibrant patterns, rugs and home accessories. Not only did this awesome party train give commuters a taste of IKEA’s wares, but it no doubt made their train journey a little more fun! The pop-up IKEA showroom gave Tokyo strap hangers a treat as they boarded the train at Tachikawa station. Rather than the expected dull interior, IKEA jazzed up the monorail with their signature bold colors and patterns. The train benches were transformed into comfortable couches upholstered in IKEA fabric and strewn with cushy throw pillows, floors were lined with kitschy printed carpets, and lanterns and flags hung from the ceiling and on windows. Related: Chicago Subway Train Transformed Into Lush Mobile Garden on Wheels! To keep the party spirit, the center aisle was also lined with coffee tables and end tables, and stacked with party food and drinks for commuters to enjoy. The lucky passengers won a raffle for tickets given by IKEA, and enjoyed a day of food, drink, quizzes and giveaways. The colorful train circled for just two days before going back to its regular look. IKEA has proven once again that it can turn any interior into a comfortable and livable place – even the narrow confines of a moving commuter rail train. Swedish design wonder IKEA turned an entire monorail into a colorful showroom in Japan. To kick off their latest location in Tokyo near Tachikawa station, the company decorated the train with vibrant patterns, rugs and home accessories. Not only did this awesome party train give commuters a taste of IKEA's wares, but it no doubt made their train journey a little more fun!